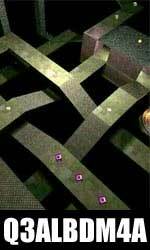 My frustating q3albdm4 map has been further upgraded to q3albdm4a, with ramps and invisible walls that make it easier for you to run backwards and shoot and not fall into a black void! These models and maps are again downloadable from my Models page. This entry was posted in Geek on November 6, 2002 by 2konbla.